This poor child discovered technology, and was abandoned by her parents. Never picked up again. So sad. This is in response to an article entitled “Digitally connected babies are not emotionally connected babies” that was forwarded to me. You can read the article at that link or not, I’ll be responding to it. What if someone told you that if you buy a SIDS monitoring device that you’ll never want to touch your baby again, and your child will eventually grow up to have dementia? That’s what the article I’m responding to posits as a possibility. The basic assumption of this person’s article is that if you use any sort of monitoring device you’re disconnecting from your baby, and the more sensors you have on your baby the less you’re going to touch, love, and appreciate it. That’s the statement of her article when it comes down to it. Now, maybe you could put the case up that with knowing the baby is fine, some parents choose to ignore the baby. That’s the only case in which any of the article makes any sense. Those people are either assholes, or are letting the child play by itself for a little time which most psychologists consider acceptable and even desirable behavior. Let’s take a look at some of these evil digital devices, there’re the blood oxygen sensors can detect pneumonia two days before it can be detected by a parent as more than a cold, and can let you know well before you can detect it that your baby’s slowly asphyxiating. I don’t see how this disconnects from any experience other than the experience of hanging out with your infant in the ICU. A line of products coming up can check heart rhythm to let you know if your baby’s stressed or has a valve failure going on. I don’t think there’s anyone out there claiming that a mother’s love can diagnose heart valve collapse yet. I’m sure there will be. This robs you of those panicked moments of wondering why the baby is turning blue. Yeah, 1900 infant mortality was 16.5% in the first year. It’s now under 1%. Around 99% make it to 18 barring accidents. These digital connections she’s against are all things that give you more info and let you stop waking the baby to discover. I don’t think a baby cares why it’s woken up, it just knows it’s been woken and it’s cranky when you’re in there attempting to determine if it’s still breathing. If baby’s wailing and you get a note on your smartphone that the baby’s temperature is 101.5 does this make you a less connected parent because you know to give her a fever reducer 30 minutes before you might figure it out yourself? Are you spending more or less quality time with your baby when it’s happy and not miserable? 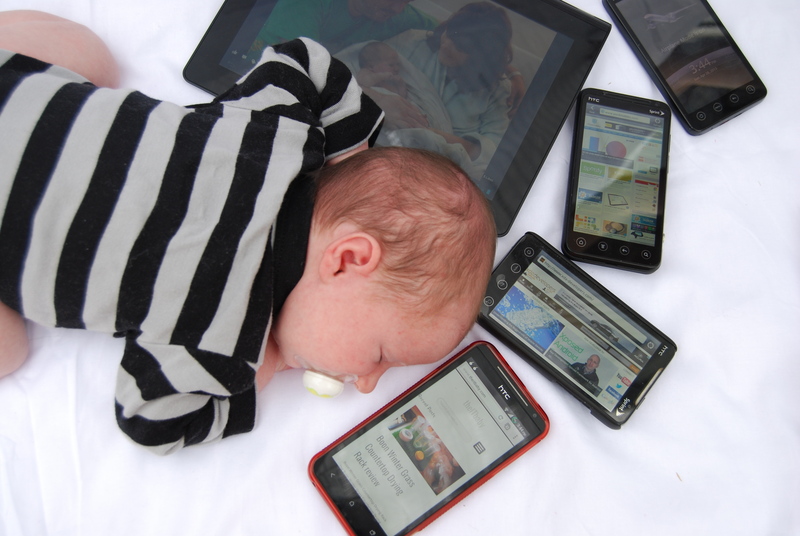 Digital technology is designed to alter the relationships of parents and babies. No, it’s designed to give the parents more information so they’re not afraid all the time. In our case it lets us know when Maggie has woken from her nap so we can wander in and let her know we’re there to get her before she feels she’s stuck in a crib. We also don’t wake her opening the door and walking across a creaky floor to check on her. It also let us sleep when we’d been fearmongered for SIDS because we had a thing that would tell us within 10 seconds if baby stopped breathing. Let me tell you, being rested parents is much better for everyone than sleep deprived parents who sit and stare all night to make sure baby is still breathing. This woman seems to think that you get a device and you immediately stop interacting with the baby. That’s a statement right after one of her many youtube clips. As if you’re going to see your baby is awake but sinus rhythms are fine and diaper unloaded so leave them sitting alone in a crib. This seems to be what she’s positing in the list as item 1. The problem for the digitally connected baby’s body is that it doesn’t know it is connected to anyone. This is any baby when put down for a nap in a crib regardless of whether there’s a digital SIDS monitor watching over the infant or not. With a monitor I know baby’s up and I am going in there to play with my munchkin. Okay, as the parent, YOU may know everything is okay, but the baby doesn’t. The baby will only know that everything is okay when you bring your warm, biological arms and pick him up. Which you’ll do when the baby has woken up or is tossing and turning in the next room because you’ve been alerted to it. Science has proven most of the memories people have before four years old are false. The average detachable travel seat is designed for up to a 25 pound child, or about a year and a half. She was probably 5 or older at this point if this is a real memory. She’s now gone from digital items are evil to to being a proponent for unsafe car seats. A detachable 5 year old’s car seat? No thanks. This isn’t a thing. This is false memory filler. Digital connection removes even the need to check on a sleeping child, let alone lift them into your arms. Why the hell am I going to rouse a soundly sleeping baby by lifting it? Is this something you do as a parent? Don’t poke the bear. The bear doesn’t like to be poked. Hi, I’m a manufacturer of a product. If you use our product and then stop taking care of your child, your child will exhibit symptoms of not being taken care of. If you hit your baby with the product, chances are your baby will grow up resenting you for hitting it with the product. This author uses the phrase “attachment research” and “science of attachment” over and over again in the article. I wonder if we have a former cognitive psychology major who was really interested in developmental psychology and basic attachment research in the house who might be able to shed some light on this… oh wait, that’s me. It’s been too long since I was studying to debate this point by point, but the author is saying “science says this” and then turning around and making a statement that doesn’t have anything to do with that science-backed statement. No really. There’s a section in which she brings out 4 key insights, I do not dispute these. They are right. She then posits her own belief that digital technology is designed to alter the relationships of parents and babies. This has nothing to with the science-backed key insights. This is attaching a personal feeling to a science backed set of unrelated statements to attempt to give legitimacy to a feeling. I’d like you to look at that statement. This is the same thing as saying science has shown the the sun is nice and warm, and a car is designed to slam into another car. A loaded gun is designed as an ergonomic paperweight. Buying a heart rate monitor will make you not pick your baby up ever again for any reason whatsoever. But sure, let’s fear monger it up for ad revenue. Also just to justify my headline since it’s a straight out response to the other headline – well rested parents are better parents. If you want to debate that an exhausted parent who can’t even think beyond wanting to go to sleep but is terrified that if they do their baby will stop breathing is a better parent over someone who got some rest because they know their child is safe and sleeping comfortably, go for it. Tech helps. Fear of tech, that’s just silly.